The axis of evil. The minion role is especially tricky. Werewolf infestation has made the village unsafe at night. You and your neighbors band together to form a night watch group to stop the problem. But can you trust your neighbors? Werewolves are devious, and while they do nasty things in the dark, in the daytime they appear to be law-abiding citizens, like yourself. Can you discover who the werewolves are (and who you are) in order to save (or hunt) the village? Find out in One Night Ultimate Werewolf! One Night Ultimate Werewolf is a social deduction microgame for 3-10 players. Players are either on the villager team or the werewolf team (or, I suppose, the Tanner team? ), and the goal for each player is to help their team win. The game set up for four players. The tokens mark which roles are present in the game. At the start of the game, players determine which roles are in the game–one for each player and three extras, two of which are werewolves. 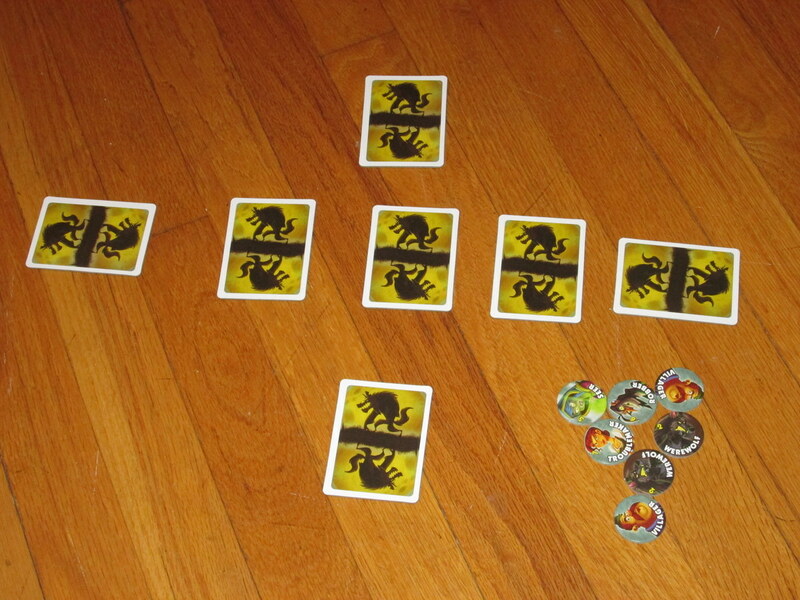 The role cards are mixed, one card is dealt to each player, and three roles are placed face-down in the center of the table. Players look at their cards, and then the night phase begins. During the night phase, most player roles have a secret action, and one player calls the roles awake in order. Werewolves, for example, can look for their teammates, as can Masons. The Doppelganger can look at another card and become that role. The Robber exchanges his card with someone else’s. The Trickster can switch two other players’ cards without looking at them. And so on. All of the roles in the game. The Tanner stands alone on a team, the werewolves and minion stand together, and the rest of the roles are on the village team. The A-Team, or Team Jacob? I wasn’t sure how I’d like One Night Ultimate Werewolf, since before opening the box it had two strikes against it: first, it is descended from Werewolf, a game I do not much enjoy. Second, there are two other games in my collection that are hard to unseat or even push aside in the social deduction category–The Resistance (one of my all-time favorites) and Coup. But somehow, despite these two strikes, One Night Ultimate Werewolf manages to be a compelling game that has instantly joined the ranks of the other two, not replacing them, but complementing them in some key ways. One Night Ultimate Werewolf fills a different niche than those other social deduction games. The Resistance, for example, gets better as more players enter the game. Designed for 5-10, it’s really best with 7-9 players. Coup, while involving some deduction, is really a bluffing game, pure and simple. Bluffs are made and called in quick succession, and there’s not much arc to the game: once a bluff is called, you either lose one of your characters or get a new one. One Night Ultimate Werewolf, while supporting up to ten players, is, oddly, best in its lower player counts (more on this in a moment). It bears a clear family resemblance to Werewolf, yet when the game is distilled to one night, it becomes its own beast entirely. And while it’s just as fast as (or maybe even faster than) Coup, the emphasis is different. In Coup, you always know what characters you have. In One Night Ultimate Werewolf, there’s a good chance you might be someone else by the time you wake up in the morning. This makes the game perhaps the most solidly deductive of them all. Not only are players trying to figure out who other players are, they’re trying to figure out whether they are who they once were and whether their win condition has changed. This is fascinating. It involves a completely different approach than, say, The Resistance, where many times the best strategy is to come out swinging, making wild accusations out of the gate to see how others react. One Night Ultimate Werewolf requires a cool, more aloof approach, since you can’t act from the confidence of your own position. With the Trickster, the Robber, the Doppelganger, the Drunk, and the Seer, players really don’t know if they are who they once were and whether someone else knows with certainty who they are. And even if players do know who they themselves are, there are always three undealt cards in the center of the table, adding to the uncertainty of everything else. Is there even a werewolf at the table? This double deduction is compelling and satisfying. And it’s short enough that if you fail in your deductions, it’s so easy to start again–the game only lasts ten minutes (or should). 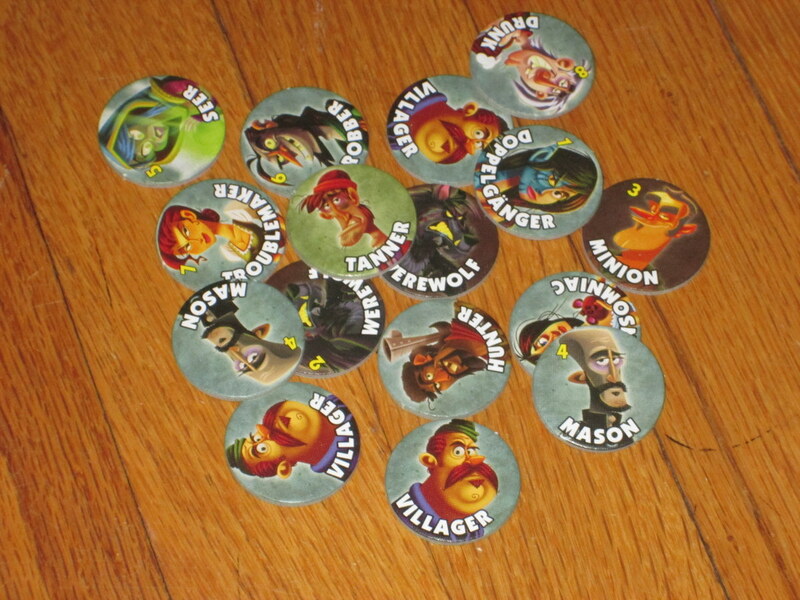 These tokens help players track which roles are mixed into the game. Very handy. 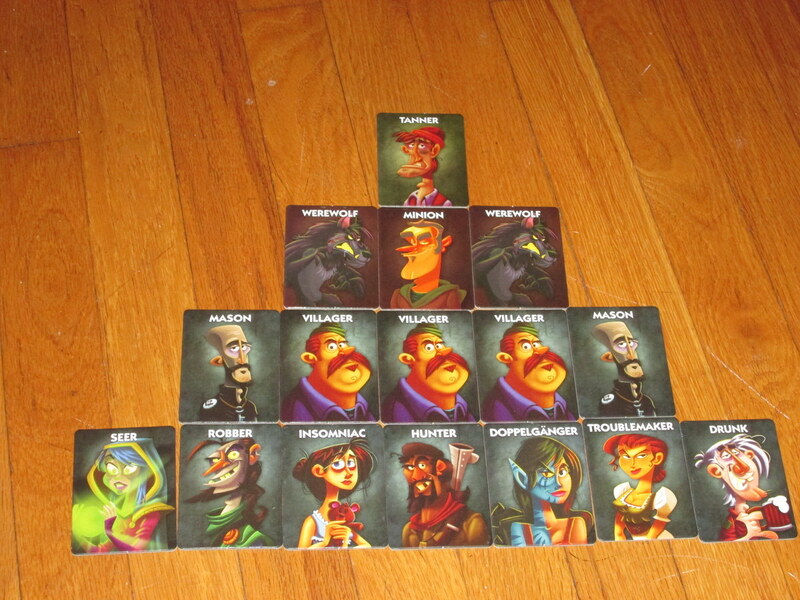 I mentioned earlier that One Night Ultimate Werewolf works best on the smaller end of the player count. The reason for this is purely logistical. In order for the game to really work, it’s best if all players are within reach of all the other players’ cards. This can be hard to achieve with anything beyond six players, at least in my contexts. The rules suggest maybe having players stand around the table during nighttime if you have a large group, and I suppose this can work, but for me I prefer the smaller, more intimate circle. (Although I am still willing to play it with more should it be the desired choice.) Social deduction games don’t seem like they’d be all that interesting with fewer than six people or so, but One Night Ultimate Werewolf really pulls it off. With three undealt role cards in every game, it’s impossible to know with certainty who is who. And with a smaller circle, it becomes imperative to know with certainty who the werewolf is: in some respects, it’s easier to hide in a large group. A lower player count also allows each player to participate more in conversation. But really, if you have a way for all players to reach the cards, it’s fine to play with any number in the player spectrum. 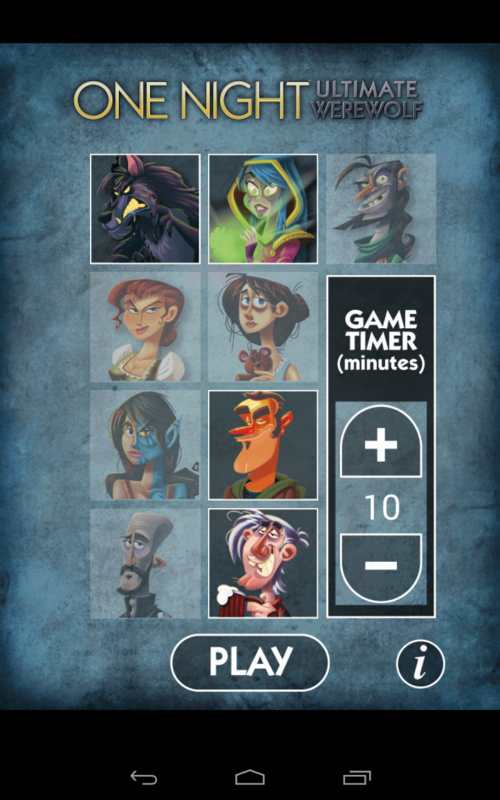 The One Night Ultimate Werewolf app is fantastic. I highly recommend it (it’s free!) if you have a device that can handle it. It’s available for iOS and Android. The numbers help even inexperienced narrators keep track of when to announce each role during the nighttime. 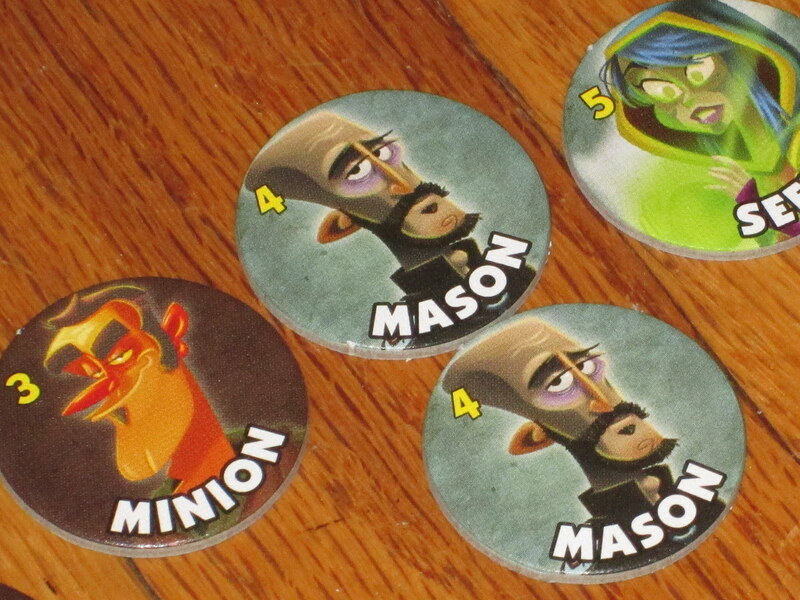 The components for One Night Ultimate Werewolf are good. The character “cards” are on thick, sturdy tile and are easy to pick up and move around the table, and players are able to do so surprisingly quietly. The rulebook is complete and offers just enough direction to allow players to experiment with everything that’s in the box, and the included character tokens allow the nighttime caller to easily arrange the script according to which roles are in the game. I love the whimsical art style on the character tiles, and the box is sturdy. There are only two negatives for the components. First, the box is bigger than it needs to be for what’s included, which is a bummer for a microgame. Still, it’s small enough for travel, and I guess that’s enough. The box lid and bottom are also almost cemented together, keeping the box closed, but almost requiring a crowbar to open. The bigger deal for some people is likely to be the price. The MSRP for the game is $24.99. What’s in the box is nice, and the game works well, but the price doesn’t seem to align with the box contents. Still, you’re getting a great game with lots of replay value (and one that should stand up to wear), so that’s worth considering. Yes, this box is bigger than it needs to be. 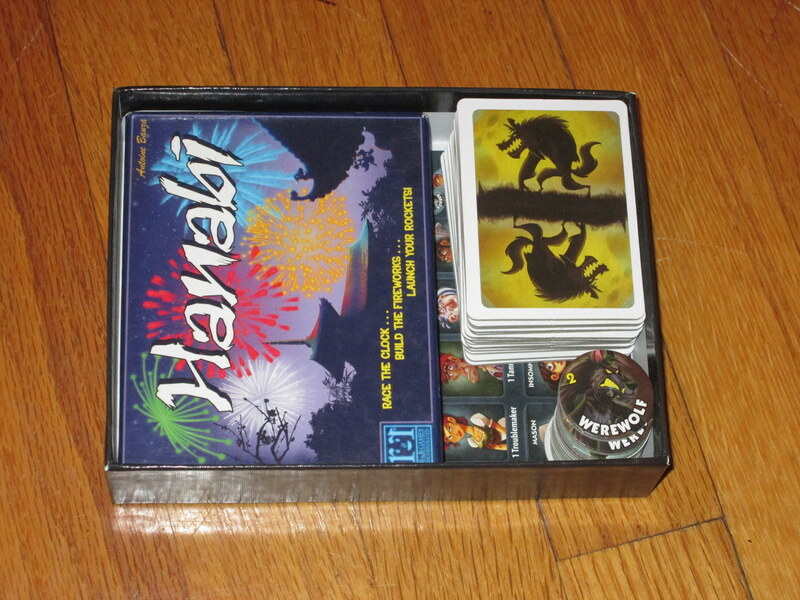 But hey, if you need to protect Hanabi or any other card game its size, the One Night Ultimate Werewolf box is a BEAST. Seriously, it’s super sturdy (for better or worse). All told, One Night Ultimate Werewolf is an excellent addition to the social deduction game canon. I like it better than its ancestor for reducing player elimination and removing the need for a moderator, and it complements (rather than replaces) the fantastic games already in its category, offering something fresh and new. Perhaps the best testimony for the game is my coworkers. The first day I brought it to lunch, I stuffed Coloretto in its oversized box, just in case my coworkers were bored after a round or two. Not only did we play the full lunch hour (five whole games after explanation), but they requested it the next week. One coworker, who didn’t have access to the game, was so impressed with it that he recreated the rules from what he could remember and cobbled together a set to play with his family that weekend. And his family loved it too. 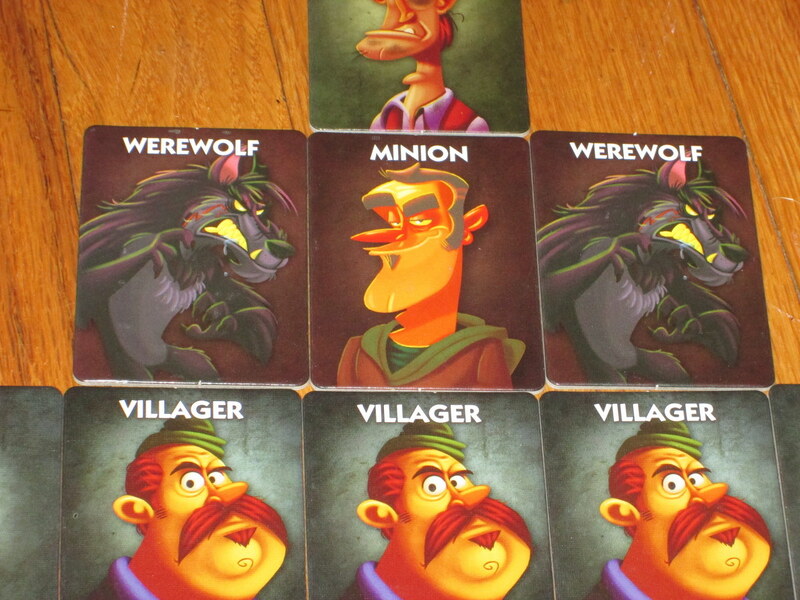 One Night Ultimate Werewolf is that kind of game: it’s short, simple, compelling, and fun. It gets people talking, and it keeps them talking the whole way through. This is a game you won’t just pull out one game night, but potentially every game night. It’s certainly a worthy choice. 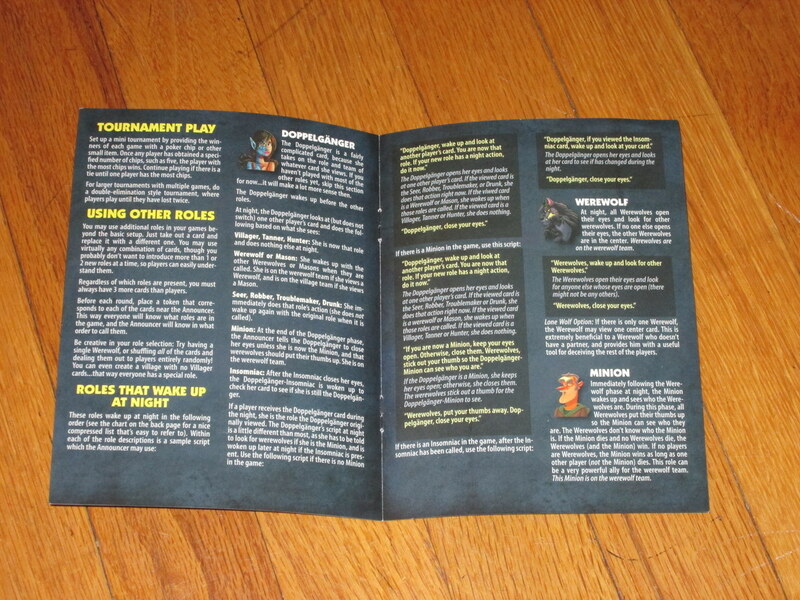 The rules are very helpful for offering different modes, hints, and tricks to engage new and even old players. 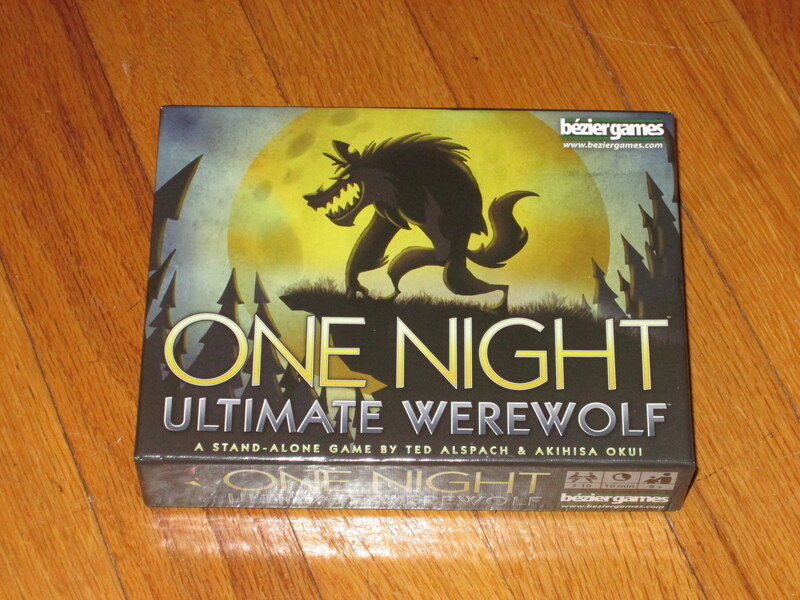 iSlaytheDragon would like to thank Bezier Games for providing us with a review copy of One Night Ultimate Werewolf. –Card marks. As nice as the cards are, after a few plays they start to show dings and scratches that could be identifying. I recommend sleeving the cards soon to prevent this (it also makes them quieter). –Role suggestions. There are a lot of different roles available in the box; it would have been nice if they had also included suggestions for what roles work best with what number of players (as you hinted at regarding “mixes”). Hmmm… The backs of my cards aren’t marked yet, but you’re right: that could be devastating. Do you have any sleeve recommendations for tiles? Are you trying to be a trickster by calling the Troublemaker a Trickster?